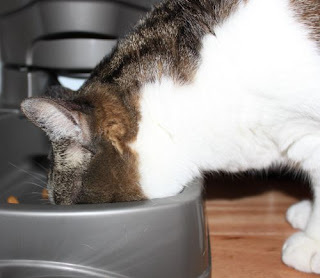 Do you ever struggle to feed your pet the right amount at the right time? I had this problem. If I slept in on the weekends, sometimes I wouldn't remember to fill my cat's bowl up the night before, so the poor thing would wake me up begging for her breakfast. I also struggled with keeping her diet in check. I gave her too much food at one time, because let's face it, it's easier to fill their bowl with more food at the get go than to fill it in increments. I'm guilty of doing that far too many times. 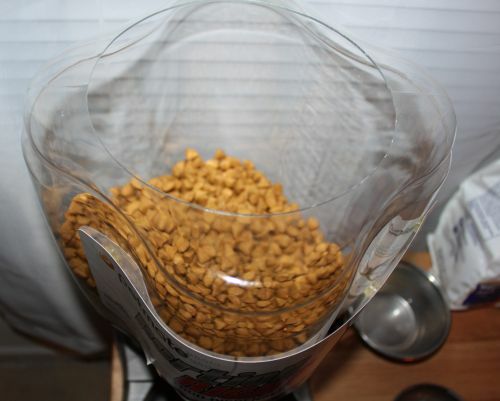 It's been a problem for me, until the Pet Mate Portion control feeder came into my life. 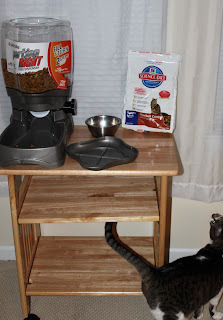 I thought this was a wonderful idea and it would solve all my feeding problems and I was right. It even helped a few more issues, like my bad back and always having to bend and lift for the heavy food. That was diminished when I could put it all into a convenient container that, with just a turn of the knob would release a perfect portion for my cat. It may not be a fancy one with a timer, but It gets the job done and is fine for me. In some ways it's better that it's not because I'm sure people forget to set the timer as well. This is perfect. I just wake up in the morning and turn the knob in two seconds, or do it just before I go to bed. The setup was a breeze without instructions. It basically came half put together. All I had to do was link the bowl to the container, fill the container with food and put the cap on and I was done. It's fool proof and incredibly simple to use. As stated above, all you do is turn the knob and the individual levers that hold the food, release a certain amount. It never releases more than I need or less than I need. If you want more portions, all you do is turn the knob a few more times. I thought maybe this big contraption would scare her away, but quite the contrary, she was intrigued by it! She sniffed it, immediately claimed her territory by rubbing her head against it, and she fell in love. I think the big container and bowl may be attractive to her as well. Bigger bowl, more food. 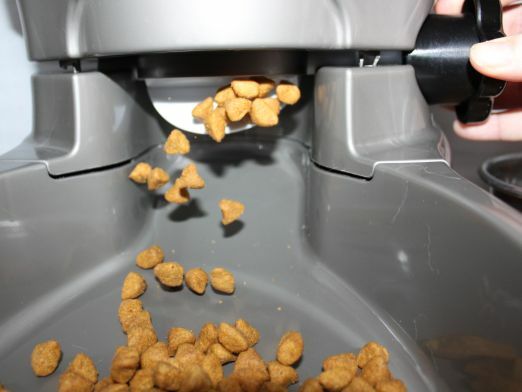 A big bonus is that the feeder is very easy to clean. It's NOT Dish washer safe , but all parts remove to clean efficient and effectively with a mild detergent in warm water. As you can see, it's quite big, so it can accommodate plenty more pets at one time. The Pet mate feeder is not wet food friendly, as it would stick to the plastic and cause unwanted bacteria and toxins for your cat. 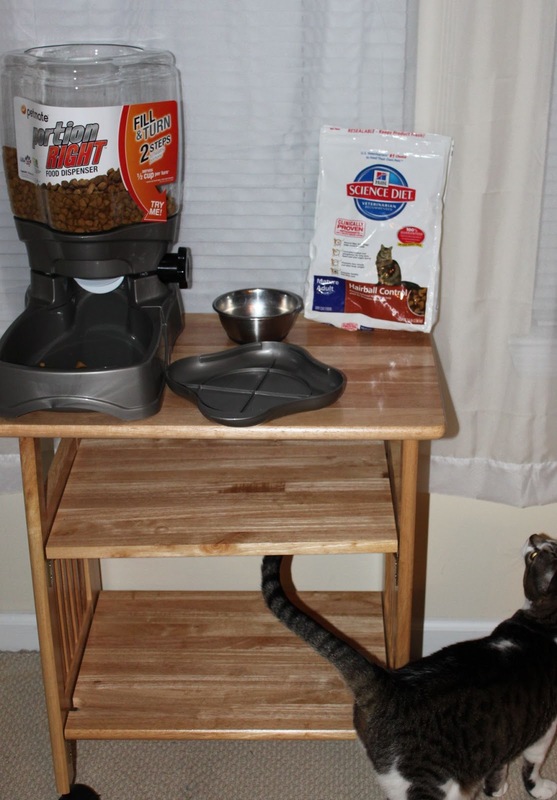 Use ONLY dry food with this feeder. 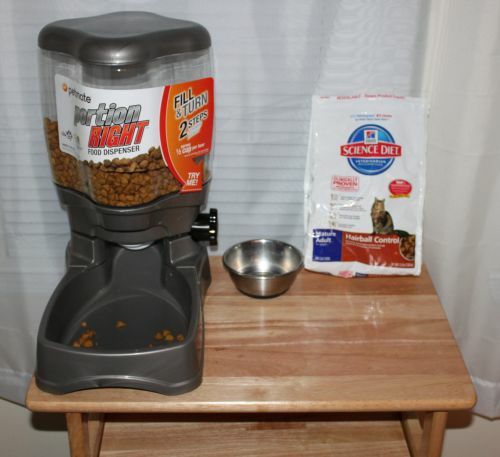 I may graduate to a timed feeder for convenience when I leave home, but for now, this is perfect for my needs and hers. I love my new feeder! You can find out more information and keep up with promotions on their Facebook and Twitter. This looks pretty fabulous! Now if I could only teach my dogs to turn the knob! LOL. I need one of these for my cats! I need one of these for my little dogs...perfect! Oh this is great! Especially since I just learned recently that filling the cat bowl all the way to the top just because it's empty is a no-no. & I'm pretty sure I can turn a knob. Thanks! This is exactly what I need for my cat! I have always had the habit of filling her bowl to the top then letting her eat as she pleases. Big NO NO! My sister is always on the go and has four dogs. She definitely needs one or two of these!